While Kelly Ayotte is expected to come away with the Republican U.S. Senate nomination in New Hampshire by a solid margin this week, she did not receive the free pass to the general election enjoyed by her Democratic counterpart, Governor Maggie Hassan. The fact that Hassan does not face a primary challenger is not an uncommon occurrence for Democrats who have quickly coalesced around their nominees in recent decades: Democratic nominees have run unopposed for the office in New Hampshire during six of the last seven cycles since 1998 and for 18 of 37 cycles since 1914. Republicans, meanwhile, have crowned their nominees without opposition in just nine of these 37 cycles. However, it is not the fact that Ayotte has to go through the motions of a primary in 2016 that is noteworthy, but that she has drawn four challengers including two former state lawmakers. Smart Politics recently reported on how dissent within the Republican Party has resulted in many GOP U.S. Senators facing stronger than normal primary challengers over the last few election cycles – usually from their right – and have been humbled as they set state party record lows en route to winning renomination. Ayotte is not quite in danger of suffering that fate, but she is nonetheless going into the record books. Smart Politics examined the 29 election cycles in which a New Hampshire U.S. 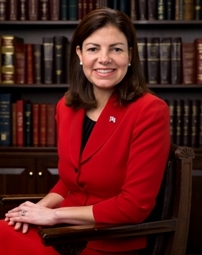 Senator has run for reelection in the direct election era and found that Kelly Ayotte faces more primary challengers in 2016 than any of her predecessors – and twice as many as the previous record. Senator Ayotte’s four primary opponents are former state senator Jim Rubens, former state representative Tom Alciere, roofing contractor Gerard Beloin of Colebrook, and Stanley Emanuel of Laconia. Both Rubens and Alciere have sought the GOP nomination in previous cycles. Rubens won 23.3 percent in 2014 – good for second place in a 10-candidate field that included two former U.S. Senators (winner Scott Brown and Bob Smith, who placed third). But the former state lawmaker has raised only about one percent of the amount of money as Ayotte, who has brought in more than $7.6 million this cycle. Alciere, meanwhile, ran for the Republican nomination in 2004 against Senator Judd Gregg (winning 4.1 percent), in 2008 against Senator John Sununu (10.3 percent), and in 2010’s open seat race won by Ayotte (0.4 percent). Prior to 2016, a total of 22 New Hampshire Republican U.S. Senators and six Democrats sought renomination over the last 100+ years. None of these incumbents had ever faced even three primary challengers and only three had faced even two: Republicans George Moses in 1926, Bob Smith in 2002, and Judd Gregg in 2004. The 1926 GOP primary saw Moses prevail over two bona fide opponents: former governor and progressive Republican Robert Bass and former New Hampshire Supreme Court Justice James Remick. In 2002, three-term U.S. Representative John Sununu defeated Senator Smith by 8.7 points with political novice Kenneth Stremsky a distant third. Smith had switched his affiliation to ‘independent’ for a few months mid-way through his term in 1999 during which he also ran for the 2000 Republican presidential nomination. He remains the only New Hampshire U.S. Senator from either party to lose a renomination bid during the direct election era. In 2004, Senator Gregg had no trouble crushing his two primary opponents – the aforementioned Alciere and Michael Tipa won only eight percent collectively. Overall, 13 New Hampshire U.S. Senators have received free passes in their renomination bids over the last century: Republicans Jacob Gallinger (1914), Henry Keyes (1924, 1930), George Moses (1932), Styles Bridges (1948, 1954), Gordon Humphrey (1984), Warren Rudman (1986), and Bob Smith (1996) and Democrats Fred Brown (1938), Thomas McIntyre (1966, 1972), and Jeanne Shaheen (2014). Twelve other incumbents received just one primary challenger: Republicans George Moses (1920), Styles Bridges (1942, 1960), Charles Tobey (1944, 1950), Norris Cotton (1956, 1962, 1968), Judd Gregg (1998), and John Sununu (2008), and Democrats Thomas McIntyre (1978) and John Durkin (1980). The expected Hassan versus Ayotte general election battle is one of the most anticipated U.S. Senate matchups in the country and is seen as a key race in the Democratic quest to recapture power in the chamber for the 115th Congress. Be the first to comment on "Kelly Ayotte Faces Record Number of Primary Challengers in New Hampshire"